The window is part of the House serves for lighting and air circulation, it also serves to make the look of the home becomes more beautiful. Therefore, beautify our homes window display will certainly beautify the look of our homes. If from outside the House, we can beautify the look of window by specifying the shape of the design, materials, and the addition of some of the ornaments, then to beautify the look of a window from inside the room can be with how to add a window curtain. There are various types and models of window curtain can we apply to beautify our window. But broadly speaking, the blinds are divided into two classes, namely, curtain and blinds. Below we will discuss about Curtains. Curtains are widely used in residential homes. 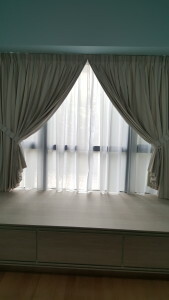 Most of the curtains are made of fabric, with the way the installation is hung on tool placed on the top of the window. Different ways of fitting make curtain models. Among them are as follow. This curtain belongs to a simple curtain, with one hanging above the revenues that also serves as the track so that the curtains can be opened the lid by means of slides. True to its name, in a display of this type of simple, memorable curtain making it suitable for interior design that is simple, casual, or minimalist. From Installation, Tab Curtains is no different and almost similar to a similar to a simple curtain. The difference is in there is a Tie Back Tab curtains that serve to tie the fabric so the arches add to the beauty created the look of the blinds. Usually at these types of curtains, assorted ornaments appear more optimally, making it suitable for modern interior design. Curtain Double Rod Pocket Curtain type, has two tracks on the top and bottom. Thus making the cloth appear neatly because it has two anchoring. Neat impression on this type of curtains is perfect for modern and minimalist-style interior. For more detail about models of curtains you can see here.